This post was co-authored by Chris Meyer, Senior Manager of Amazon Forest Policy at EDF, and Sybelle VanAntwerp, Community Economic Development Volunteer serving with the Peace Corps in Colombia. It originally appeared on peacecorps.gov. En español. The story behind Dutch chocolate company Original Beans’ Arhuaco Businchari chocolate bar begins in the tropical forest covered Sierra Nevada region of Colombia, on the Caribbean coast in the northern reaches of South America. That is where the indigenous Arhuaco nation has been able to cultivate, harvest, and sell cocoa successfully for the past two years, improving the economic opportunities for their communities while conserving the precious forest around them. This past March, the Environmental Defense Fund (EDF) organized a workshop in Bogotá that provided the Arhuaco community a platform for knowledge sharing. It also sponsored a visit by a cocoa buyer. This fruitful collaboration was made possible with the help of the US government’s Peace Corps program and EcoDecision’s Canopy Bridge, with USAID funding. It’s an example that shows how collaboration is key to conserving the remaining tropical forests and supporting indigenous peoples to develop alternative economic activities that align with their cultural values. For the Arhuacos, the collaboration is already generating results and they are sharing their experience with entrepreneurial indigenous groups throughout the country. The buyer visit, a key element of this collaboration, took place at the Arhuaco cocoa processing center just outside of Santa Marta, Magdalena. Jan Schubert, from Original Beans, the Arhuacos’ principal European partner, spent almost two weeks in the region promoting community cocoa initiatives. According to Original Beans, the company has a distinctive vision to “replenish what we consume” – focusing on biodiverse agroecosystems, reforestation, sustainable value chains, and community involvement. It is more than just a chocolate company. Currently, Original Beans makes their own Arhuaco Businchari bar, has an exclusive agreement for single-origin couverture with JRE Europe restaurants, and also recently started selling cocoa beans to small-scale chocolate makers through the Original Beans warehouse in Amsterdam. During the visit, Schubert supported several efforts, including working closely with members of the Arhuaco community association ASOARHUACO to plan out the next steps in the organic certification process. This will be crucial in the coming year to increase Arhuaco cocoa’s commercial value and reach a wider market segment in Europe. Although the community’s cocoa production is yet to be certified, Arhuaco producers follow organic cultivation principles aligned with their cultural values. Challenges of geography and communication make organic certification especially difficult. Original Beans used this most recent visit as an opportunity to strategize with association leaders, especially around the organization of baseline GPS information for each producer that will be evaluated by the certification body. In the remote Arhuaco village of Bunkwimake in the higher altitudes, the vision is to continue developing a nursery that will house native tree species and eventually rescued cacao bunsi, or white cocoa, which is a unique variety that is native to the Sierra Nevada. Original Beans donated materials to construct a nursery and is exploring the possibility of installing an irrigation system, collaborating closely with community leaders and advisors to determine the next steps of support. 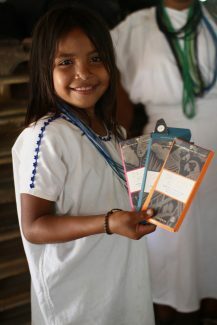 A girl from the Arhuaco indigenous nation in Northern Colombia samples a selection of chocolate bars from Original Beans, a sustainable chocolate company that is partnering with the Arhuaco nation on cocoa production. Photo by Original Beans. Arhuaco indigenous leaders have begun looking to share their experiences with commercializing cocoa and coffee beyond their community. Arhuaco leaders Francisco Villafaña and Jader Mejía presented their experiences at the Third Macro-Territorial Meeting on Economies for Indigenous Peoples of the Northeastern Amazon in Bogotá. Organized by EDF, the GAIA Amazonas Foundation, and Global Green Growth Institute, the workshop served as a noteworthy moment of capacity building between indigenous communities. Villafaña and Mejía’s presentation told a success story of indigenous entrepreneurship. They spoke about the development of the value chains of both cocoa and coffee, key partners and aid organizations that have helped them in the process, and overarching successes and challenges. One prominent partner that has helped the community since 2009 is USAID and ANADARKO, through the nonprofit ACDI/VOCA; in addition, the community has received national government support through a UNODC alternative livelihoods program to replace illicit use crops. Villafaña and Mejía demonstrated the Arhuacos’ achievements, which serve as a model for other indigenous groups, including creating their own brands and small batches of chocolate bars and coffee through this financing. For the Arhuaco presenters, the forum was invaluable as they continue to develop the marketing skills necessary for successful business growth. Not only were they able to gain experience with public speaking, but they were also able to network with potential business partners. In response to the Arhuacos’ presentation, workshop participants highlighted that profit is not always a sufficient incentive to develop an economic activity that is in line with indigenous values. The speakers portrayed profit as a tool and resource, rather than an objective, to achieve loftier goals such as increasing market access or infrastructure, improving food sovereignty, and reclaiming territories. The participants supported the idea that communities need to drive their own projects, instead of being led by outsiders that have less of an understanding or stake in the work within the community. Foreign organizations have a greater impact when they empower community leadership, help strengthen existing structures and create learning opportunities within each process so that participants can become self-sufficient in the long-term. Narratives such as that of ASOARHUACO might generate new ideas among participants for project proposals; there is a significant call for community-driven projects from the Colombian government through its Indigenous Pillar of the Amazon Vision Program (PIVA). Ultimately, Villafaña and Mejía offered the workshop’s participants a shared perspective relevant to Colombia, stemming from a wealth of common experiences in developing economic opportunities consistent with their indigenous culture. From Bogotá to Bunkwimake, this collaboration is strengthening the Arhuacos’ efforts to market their products and ultimately drive their own processes. It connects the community members with new experiences, opportunities, and partners that empowers individuals and increases the community’s sense of ownership over its cacao production. The cacao wager has not been won; the community must continue to insist on its short, medium, and long-term objectives. For this reason, it needs to continue carrying out institutional management and leadership to achieve its dreams of the peace, balance, and health of Mother Nature. This entry was posted in Agriculture, Forestry, Indigenous peoples. Bookmark the permalink. Trackbacks are closed, but you can post a comment.